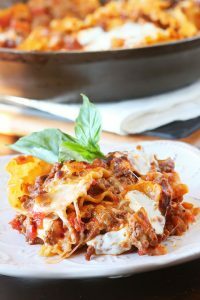 This quick and delicious homemade skillet lasagna is so easy to make for a dinner on the fly or evening get together with friends. 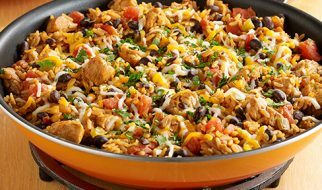 No mess mixing in different containers or worrying about various levels of prep, through it all in one skillet and you’re off! This is a favorite of ours when we just haven’t planned anything else and my brother, who’s quite the picky eater, loves it too! 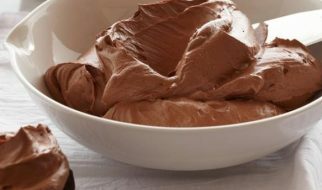 While this is cooking you can throw together some Decadent Chocolate Cake in a Skillet as dessert afterwards! Cook meatloaf mix in a large skillet over medium-high heat, breaking it into pieces until thoroughly cooked. Roughly 5 minutes, then drain off the grease. Stir in salt, pepper, garlic and red pepper flakes and stir for 30-60 seconds. Add in lasagna noodles, then pour in marinara sauce and water over them. Cover and cook, but make sure to stir often, adjusting the heat as needed on your induction cooktop to keep everything at a good simmer until the noodles are tender; about 20 minutes or so. Remove skillet from heat and stir in half of the mozzarella and parmesan, adding additional salt and pepper as needed. Add heaping tablespoons of ricotta cheese over the noodles and add remaining parmesan and mozzerlla. Cover and let stand for another 5 minutes to allow the cheeses to fully melt over the lasagna. Season with basil and serve! Let us know if you tried the recipe and how much you enjoyed it or things you think might make it even better!